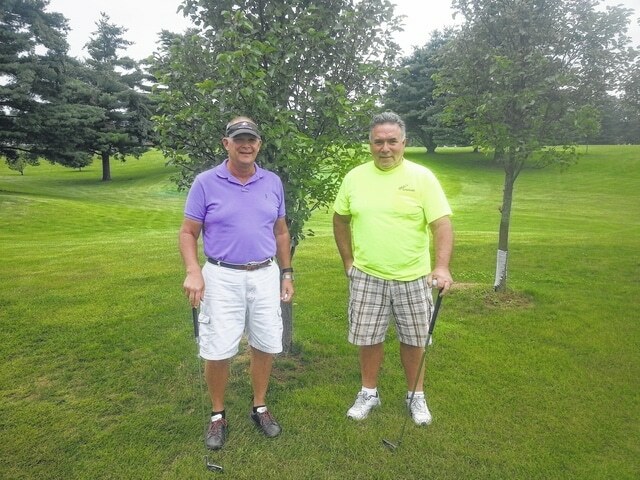 Pictured left to right: Bob Konstam andt Tom “Ace”Fisher who had just hit his season’s first hole-in-one. Wednesday night men’s golf league at Little Apple Golf Course. Tom Fisher recorded an ace/ hole in one on hole number 8 a week or so ago in our Wednesday night men’s league. His playing partner Bob witnessed the feat. If you know Tom Fisher, then you know he has that smooth left-handed gift. His golf game can erupt at any time. Tom and Bob are two of the best people you could possibly play a round with. They certainly enjoy their time out there and have been known to enjoy their time once they get back to the clubhouse also. My partner, Rob Kaminoff and I witnessed firsthand Bob and Tom playing against us this past week. We can attest to his masterfull skills firsthand. Although we did not see him record an ace, you can just tell that he has got game. He is very very dependable and is always a joy to play a round of golf with. I still don’t understand why the person that hits a hole-in-one has buy a round for everyone else. That’s just not right. Until next week have a good one.